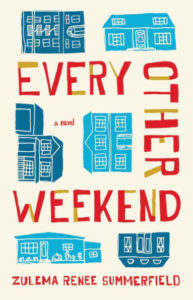 Zulema Renee Summerfield’s new novel Every Other Weekend is one of those books that starts out a little weird but grows on you while you’re reading it, so that by the end you realize that, damnit, you really do care about these characters. Nenny, an 8-year old girl in Southern California in the 80s, lives with her mother and two brothers. Her parents get divorced, and she spends time with her father on weekends. Then her mother moves in with a man with two kids, and Nenny joins the “every other weekend” club of broken homes and blended families. She’s an anxious girl with a lot of fears, but she keeps them to herself and doesn’t confide in her mother, despite desperately wanting to. She does her best to navigate the tricky waters of humorless stepfathers, moody older stepsisters, a befuddled father, and a mix of classmates dealing with their own issues. Every Other Weekend is a quiet book. Nenny is introspective, an observer, and so it’s through her eyes that we watch the fragile bonds of this family get tested and strained. Things often go wrong, and while there is a lot of sadness, there is also a fair amount of gentle humor here. I think the most poignant parts for me were the references Nenny made to years later, when she asked her siblings and stepsiblings about what they were thinking during the time period in the book. Each of them was dealing with his or her own issues and problems, and yet they were barely connecting with each other, when they could have been a source of solace. I like Sumerfield’s writing. It’s atmospheric and almost poetic at times without being pretentious. There’s also some 80s period detail in here, which I enjoyed. As to why Summerfield set the book in the 80s, I think there are two reasons: 1) divorce was becoming more common but it was before there was so much emphasis on the helping the kids handle it; and 2) the lack of social media and technology only heightened these kids’ feelings of isolation. Every Other Weekend is a quirky, mostly sad book, and I am glad I picked it up. I am excited to see what this author does next.